“Finding Yourself” by Marcel Goulding, USA, is the Highly Commended story in the junior category of the first biannual Short Story Contest 2018. My name is Josh Flipmore and I am paralyzed from the waist down. Ilive in New York City, but my neighbourhood looks more like Beverly Hills. I go to a private school where bullying is encouraged. Lance is one of the mean kids at my school. He always makes jokes about how I can’t walk. Lance is a jerk. My dad thinks it will toughen me up. My mom and grandma understand though. Mom says when she was a kid she was teased about how she still carried a doll around when she was eight. I’d rather carry a doll than be a cripple. Sometimes I forget what it feels like to run and play and just walk down to the store to read comic books. Not that I was ever allowed to do that. Mom is really overprotective. I used to be able to walk, believe it or not. But that was eight years ago and now it seems so far away. Yesterday I tried to walk. I hadn’t tried that since my accident. I fell on my face and got a talking too. I build with Legos every day, and it makes me feel free of the wheelchair. Just for a bit. Ding dong! Good, Grandma’s here. I wheel myself to the door and open it. She always makes me happy even on my worst days. At dinner we talk. Dad is away on a business trip so it’s just me, Grandma, and mom. I don’t want to talk about school right now. The Sun is hurting my eyes. Oh no, school today. I do my best to pull on my uniform. Mom doesn’t have to help me much these days. Mom drives me to school. My school is three stories tall and is a boring light brown. As I wheel myself up the path, Lance runs by. Why does Lance say stuff like that? The day drags on. Lance takes several more cracks at me through the day. When the day is finally over, Mom and I take a walk through Central Park. If you can call it a walk. Just then some little kid on a skateboard zooms straight toward me. It’s too late to get out of the way. We collided. My wheel chair skids and turns over with a deafening crash and I hit the ground hard! He falls to the ground and jumps up smiling. What’s wrong with him? “Sure,” I said, even though I really don’t. Mom helped me up. “Maybe” I said. I was not too thrilled by the idea. It’s quiet at dinner. It’s Dad’s first day back from his business trip. The last one took him away over two months. “So, I’ve got this really big deal coming from South America and it looks like I’ll have to leave tomorrow,” said Dad. “Dear, you just got back, think of Josh.” Good old Mom. Dad left this morning. It looks like this trip will be even longer than the last one. I try not to think about it at school. Besides, I have enough on my mind. The teacher is assigning partners for reports on the human body. Guess who I’m with. Lance rushes past me at the end of the day. “See you later partner.” When I reach Mom I have a surprise. That kid from the park. What was his name, Randle or Ricky or something. “Hey Josh your Mom says I can come over.” Jeez, what a great surprise after a hard day at school. I feel embarrassed by riding with a fourth grader. But I don’t have any other friends so I’m not one to complain. Lance gives me the thumbs down through his car window and sticks his tongue out. “So what’s your house like?” he asked. “Big” I replied. We arrive and Ralph heads straight to my room. That is where I don’t want him to be. Unless you’ve noticed this kid is basically a wrecking ball with legs and my room is where I keep all my Legos. In my room he’s messing with my Legos and electronics. “Not now,” I answered. I mean, that thing took me three years to build. I’m not going to let some fourth grade punk ruin it. I’m getting fed up with this kid. I had an accident when I was five. I still don’t know why this kid is so interested. “I don’t remember, ok, just go away!” I yelled. Even though this is the most annoying kid I’ve ever met, I feel bad for snapping at him. “Maybe you can play with the battleship,” I toldhim. It’s my way of saying sorry. “Aww, thanks dude,” he mutters, but I can see he feels better. “Hey I know how it feels,” he said. I can’t imagine this fourth grader who looks like he’s never had a cut in his life to know what it feels like. Wow, I think. Maybe I was wrong about this kid. “Is that true or are you just saying that to make me feel better?” I asked him. “And I spent two years in St. JUDE,” he continued. This kid is really lucky, I think. Most kids who go into St. JUDE don’t come out good enough to skateboard into wheelchair people. That’s why we should always be thankful about who we are.” “Look at me,” he said. 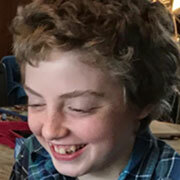 “I’m probably not going to live through these next few years coming up, but I want you to pass on my message to others who are challenged in one way or another when I am gone.” And at that moment I know I will always be glad for who I am and try to make other children feel the same way, by passing on Ralph’s message. Always be thankful. And I am.